This series of photographs shows the handing over of the Colours of the 1st Battalion, East Kent Regiment, the Buffs, on 10th May 1923. 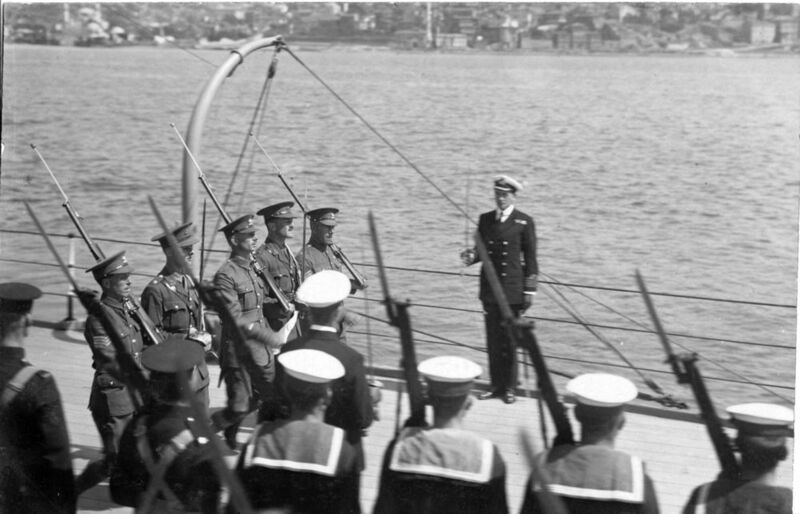 The photographs were taken on board HMS Royal Sovereign, at anchor off Istanbul. The stand of two colours is being handed over. A Navy guard of a Sub-Lieutenant, Petty officers (?) and a Royal Marine are marching with the covered Colours. In this photograph, the guard halts and a Royal Navy officer uncovers the Regimental Colour. 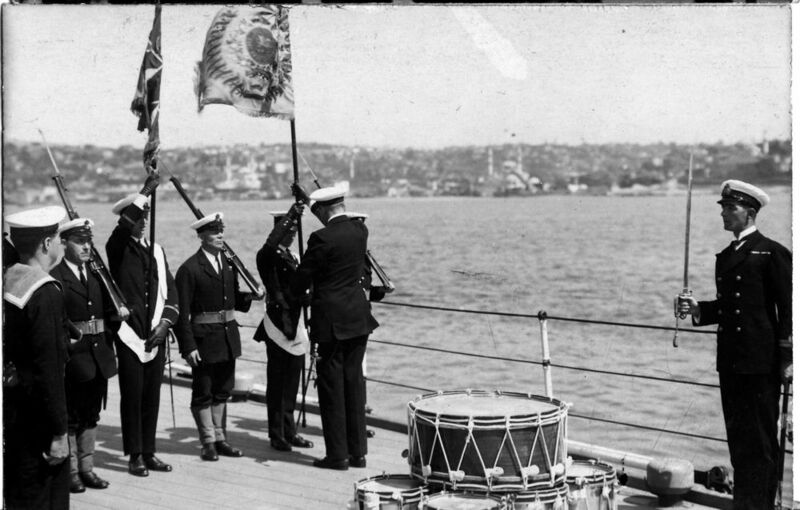 I suspect that the drums on deck also belong to the Buffs. The minarets of Istanbul can be seen in the background. 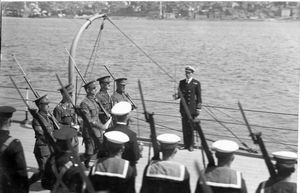 There was a considerable presence of British troops in and around Istanbul following the First World War and the partitioning of the Ottoman Empire, the British being particularly interested in maintaining access to the Sea of Marmora. Furthermore, there was much tension in this region given the proximity of the different countries and states still in various degrees of effervescence. Take, for example, the Chanak crisis and the threat of a war between the United Kingdom and Turkey in 1922. 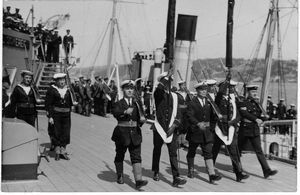 Two Buffs officers with swords out and their guard advance to collect the Colours whilst the Captain of HMS Royal Sovereign stands to attention with his sword. Note the very prominent protections on the bayonet tip. 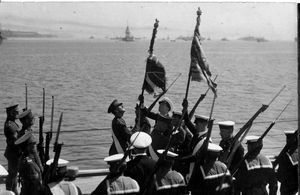 The Navy guard has about turned and officers of the Buffs are taking possession of the King's Colour (left) and the Regimental Colour (right). Note again that several bayonets have a protection on the tip - when manipulating rifles in such a confined space, it is better to avoid poking someone's eye out. 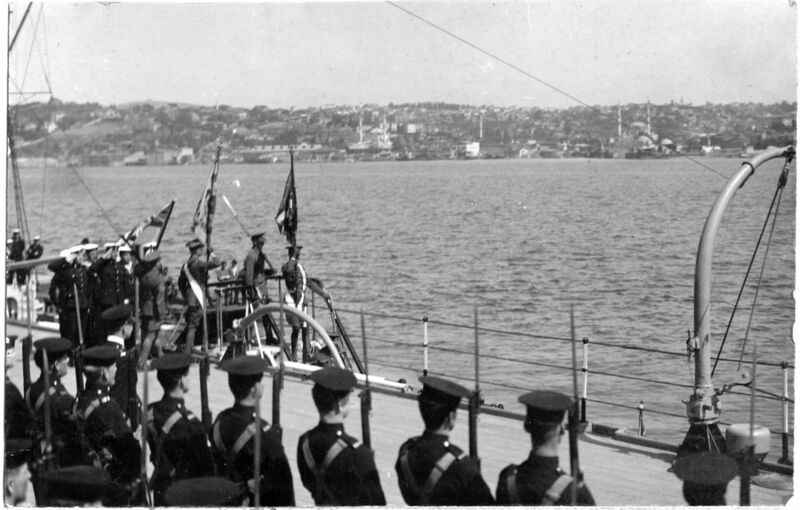 The Buffs had been garrisoned at Bostandjik (now a suburb of Istanbul and called Bostanci) and had given their Colours to HMS Revenge for safe keeping whilst the Buffs were in Turkey. HMS Revenge left Turkish waters in 1923 to join the Atlantic fleet and the Colours were placed on HMS Royal Sovereign. 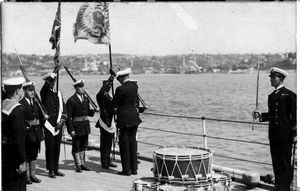 Perhaps in anticipation of end of the Allied occupation of Istanbul (October 1923) and the Battalion's subsequent move to Gibraltar, the Buffs retrieved their Colours from HMS Royal Sovereign and it is this ceremony that is recorded in the five photographs. The Buffs have got their Colours back and prepare to disembark whilst Royal Marines salute them. Strangely, there appears to be a flag or Colour in the boat that is waiting to take the Colour party ashore (see just left of the davit). I would like to acknowledge the contribution of Graham Thompson and his meticulous researching to identify the origin of the ceremony seen here.